Be sure to visit Monnit in Booth# 639 at MobileCON 2013, October 16-18, 2013 in San Jose, CA. Executives will be on hand to answer questions and show you how easy it is to get started with a complete M2M wireless sensor solution. For more information on the show or to register, please visit www.mobilecon2013.com. Before you can calibrate your Monnit wireless sensor, it is important to note that you will need to have an accurate source for comparison to the Monnit wireless sensor. If calibration is possible for a sensor, the “Calibrate” tab will be visible in the detail view. Click the tab to open the sensor calibration settings window. To calibrate a sensor, you will want to ensure that the environment of the sensor and other calibration device is stable. Note the “Expected Next Check-in” time for the sensor you are calibrating and take a reading from your calibration device a few minutes prior to the sensors next check-in. Enter the actual (accurate) reading from the calibration device into the text field, then click “Calibrate”. To ensure that the calibration command is received prior to the sensors next check-in, press the control button on the back of the gateway, once, to force communication (Cellular and Ethernet gateways). If using a USB gateway, open the gateway application on the PC and click the “Send Messages to Server” button. After pressing the “Calibrate” button and pressing the gateway button, the server will send the command to calibrate the specified sensor to the gateway. When the sensor checks-in, it will send the pre-calibration reading to the gateway, then receive the calibration command and update it’s configuration. When the process is completed, it will send a “Calibration Successful” message. The server will display the sensor’s last pre-calibrated reading for this check-in, then all future readings from the sensor will be based on the new calibration setting. Managing office and commercial buildings efficiently, yet cost effectively is challenging. Whether it’s a large or small office Monnit has a reliable, wireless, remote monitoring solution that can easily work with your companies existing Wi-Fi networks. Monnit’s affordable WiFi Door/window sensors and motion sensors can be used to monitor for unauthorized access. Water sensors can detect plumbing leaks around water heaters, faucets and toilets.Temperature sensors can track HVAC systems for efficient operation, helping you lower operating costs associated with heating and cooling. All Monnit wireless sensors come with Free basic online monitoring, allowing you to view sensor information anytime from anywhere. Receive instant notifications via email or SMS text if a set sensor condition is met or exceeded. 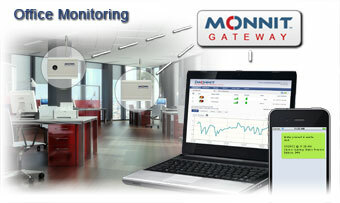 Ensure that your office building is being maintained properly by using Monnit wireless sensors.